We’ve updated our Android app. This new version is now compatible with Guitar Pro 7. 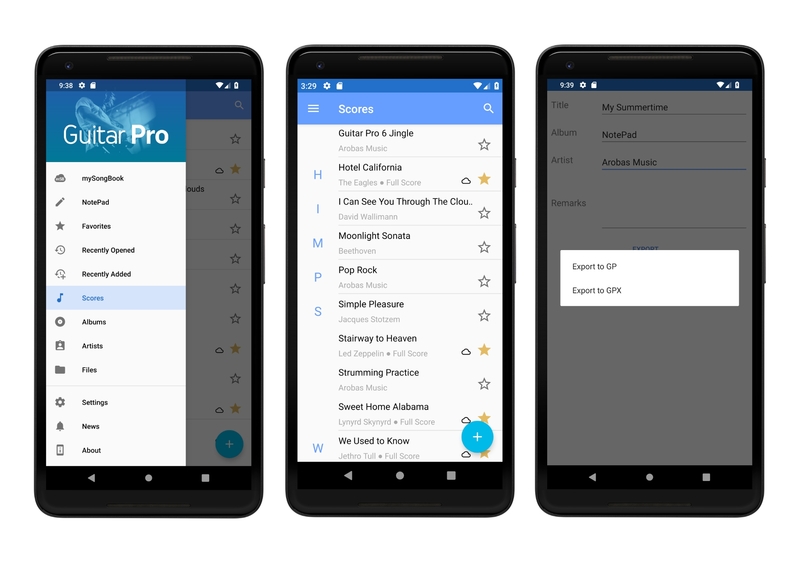 Let’s take a look at what’s new in Guitar Pro 1.6.0. To visually mark the new compatibility of the mobile app with Guitar Pro 7, the application icon and interface colors have been changed. The Guitar Pro 6 red is replaced by the Guitar Pro 7 blue. This update also allows reading 9/10 strings tabs and opening password protected files (files locked in Guitar Pro 7 software to prevent opening or editing a music score). This app is the perfect tool for learning, practicing, and playing your favorite compositions and songs anywhere, anytime. 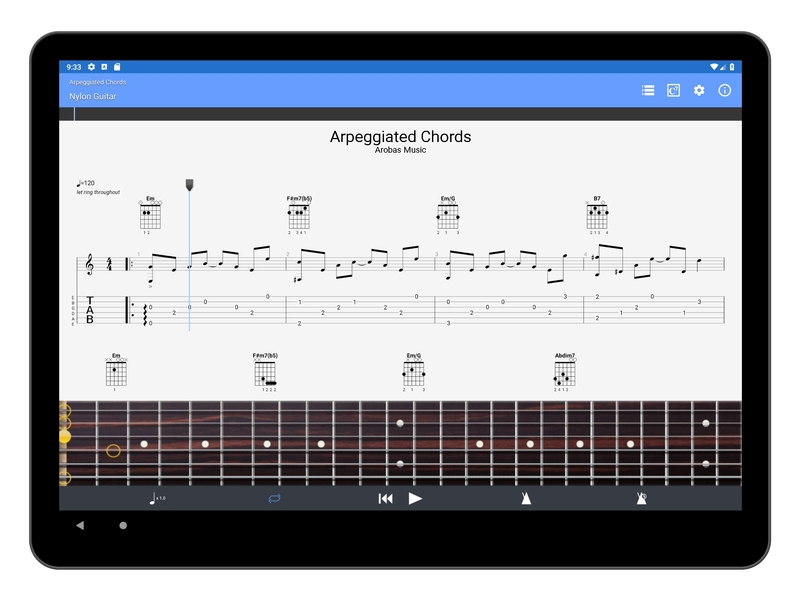 Choose the notation mode for display (tablature, standard notation, or slash), add or hide the fretboard/keyboard, use the metronome and the visual countdown, change the tempo, transpose your piece by half-tones. You can use the NotePad tool to write up a riff idea or a melody. It is now possible with this update to export your composition into .gpx and .gp formats (Guitar Pro 6 and 7) and later carry on with your song in Guitar Pro for Windows or Mac. The NotePad tool allows you to create a single-track tablature for guitar, bass, banjo, ukulele, and mandolin in your application. Customize the tuning (4- to 8-string instruments), the tempo, the sound (19 sounds available) and find all of the usual musical symbols pertaining to the guitar and to other stringed instruments. This version also includes some bug fixes and improvements to bring you the very best of the Guitar Pro experience. Open the Play Store application and tap My Applications and Games. Search for the Guitar Pro application and tap the Update button. Please have a look at the tutorials available in our support section or contact our team to share your suggestions, feedback, or to report a bug. Can we please get multi-track composition for the mobile app! and perhaps some of other features from the desktop app? Seems to be an excellent program, can I have a trial? Hi Azz, thank you for your suggestion, I have sent it to the dev team. Have used Guitar Pro 6 a lot in the past, always thought it was good and expected this to be a very stripped down version. But I’m struggling to change the tempo on songs that I load at the moment….. any tips ? Hi Andy, if you are using the Guitar Pro App on Android, you just need to click on the metronome shaped button on the right. If you can’t find it, please send a message to our support and the will help you. How can we set the settings like what we have in the previous versions (where we can see all the bar lines in the screen)? Olá bom dia, gostaria muito de adquirir esses programas mas tenho dificuldade em dominar a linguagem por não existir versão em Português. Guitar Pro 7 está disponível em Português. Para alterar o idioma, vá para Preferences… (menu File ou Guitar Pro) > Interface > Language > Portuguese. How can i update my android version 1.6.2 to 7? I have a licence for the windows version. I buy gp6,gp7, also have iOS version and android version and I pay my songbook subscription. When the mobile versions will can read the files from my songbook subscription files? Hi Javier, since the last update you can open your tablatures from mySongBook into the app. Just touch the mSB logo at the bottom of the screen. Thank you. On PC I have been using Guitar Pro for a very long time. I would very much like to download and use the app. Unfortunately, it is required that money is collected through Google. However I will never share my active account information with Google, let alone make any transactions through Google.